New features often trickle down from high-models, but it’s not often you see that happen within a month. The new entry-level Nikon 1 J4 shares many of the high-end features of the flagship 1 V3 including the 18-Mpix CMOS sensor sans AA filter, Expeed A4 processer, extended ISO 160–12,800 sensitivity range and new, wide-area hybrid AF system. It boasts a total of 171 AF points, with 105 points linked to dedicated phase-detection pixels on the imaging sensor which promises fast AF and covers nearly the whole frame, Like the 1 V3 it doesn’t have a built-in EVF, which is in extra on that model but sadly not an option on the 1 J4. While it lacks the necessary accessory shoe, it has a tiny built-in popup flash instead, a feature that’s arguably more important to the target audience. Still, it has a similar 3.0” 1.04M dot touchscreen rear LCD (albeit not tilting), same 20 fps burst option with continuous autofocus and even shares the 1 V3s 1080/60p and slow-motion (120 fps) video capabilities of its far pricier sibling. The Nikon 1 J4 is available now in a choice black, silver, white and fetching orange color finishes at $599 including the 10-30mm f3.5-5.6 PD-zoom. 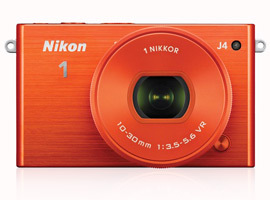 The Nikon 1 J4 isn’t the only contender in this compact class. Both the 16-Mpix Panasonic Lumix DMC-GM1 and Olympus PEN E-PM2 can claim the relevant credentials to be serious challengers to the Nikon. Neither can match 20 fps with continuous AF but they can boast physically larger micro Four Thirds format sensors with almost twice the surface area and the better performance. 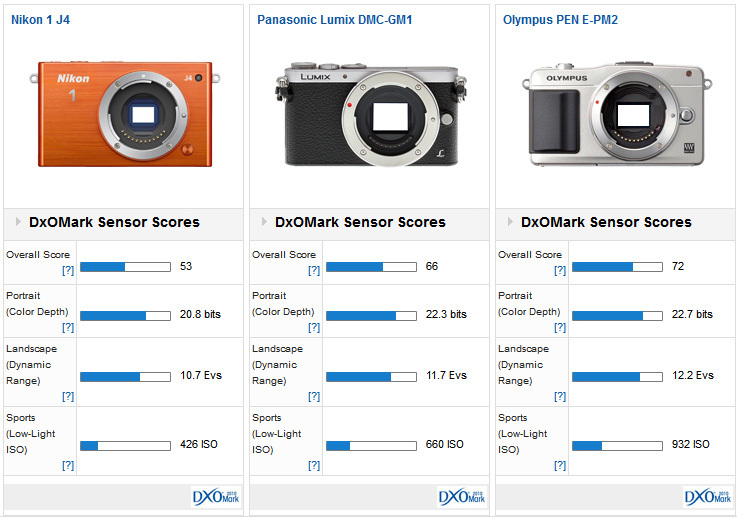 The older (late 2012) E-PM2 can even outclass the Lumix GM1, but both surpass the Nikon in every one of the DxOMark performance metrics. Color depth measurements with differences of 1-bit are rarely noticeably but with a 1.5 to 1.9-bit variance these two rivals show a clear advantage over the Nikon. 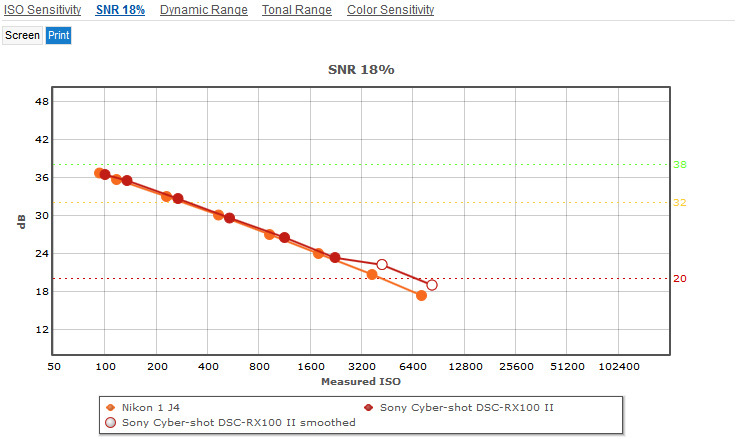 And it’s the same with the dynamic range and low-light capabilities. 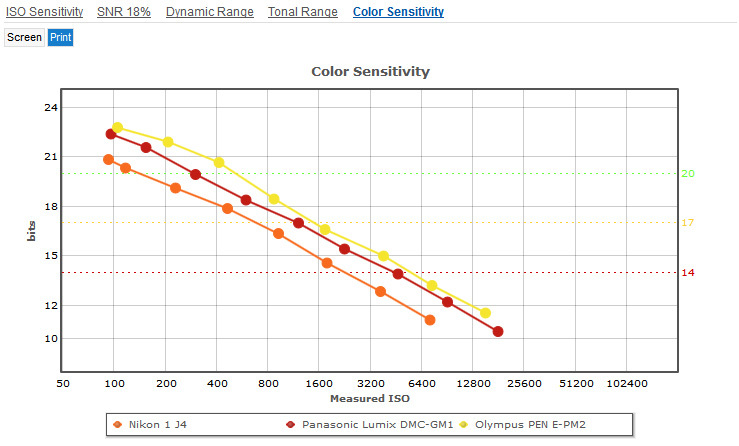 The E-PM2, for example, has over +1 stop advantage in ISO sensitivity. Color sensitivity is a bit below par. At $699 the 20-Mpix Sony Cyber-shot RX100 II lacks the obvious flexibility of interchangeable lenses, but it shows what can be achieved with the same size sensor. 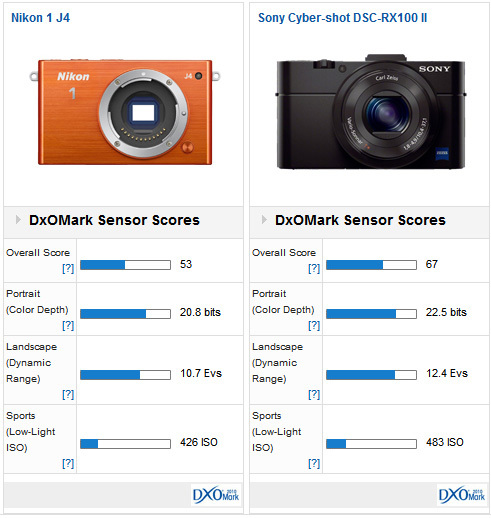 It has a 12-point lead and significant improvement in the overall rankings on the Nikon as a result, but the main point to take home is the superior color discrimination and wider dynamic range, for what amounts to only a small increase in pixel count. Curiously, although the Sony adopts BSI architecture and despite the loss of an undisclosed number of pixels dedicated to the 105 phase-detection point, the sensor in the Nikon 1 J4 is a close match in low-light performance. Despite some theoretical advantages with the design of the Sony sensor over the Nikon in this category, lowlight capabilities are very close indeed. We like the contemporary looks, small size, impressive AF and of course the system is maturing. 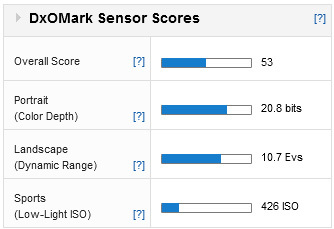 Adopting the same sensor as the Nikon 1 V3 will certainly help the Nikon 1 J4 gain some traction with sales, given the price, but sensor performance isn’t as good as it could be and is really only on a par with some (albeit high-end) compacts.